Tegra Medical faced profit erosion as costs went up and customers demanded price cuts. The company wanted to automate with robots, but operations are located in mini-cells in confined work spaces where operators have to interface with the automation. Erecting big safety caging as required with traditional industrial robots was not an option. Tegra was also looking for a high volume robotic solution that they could install, program and maintain on their own without any external assistance. 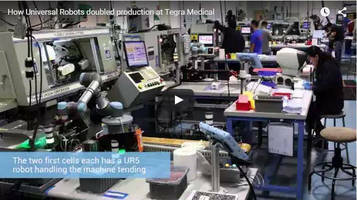 Tegra opted for 2 UR5 robots and 1 UR10 robot each tending machining cells that produce artery closure devices and Meniscal repair devices. The two UR5s pick up blanks from the feeder, move them between a lathe, a grinder and a conveyor in a cycle that now takes only 10 seconds compared with the 22 seconds with manual labor. The UR10 robotic cell is an unusual, mixed model cell feeding three different part numbers simultaneously in the same machining cycle. "We were looking at cost, accuracy, ease of implementation and ease of use. The Universal Robots seem to nail it in all those areas; the price point for what they were offering was extremely competitive, the accuracy and the design was just far above and beyond what we thought anyone else in the market had," says Hal Blenkhorn, Tegra Medical’s Director of Engineering. "With the UR robots, we only get a few rejects per day. Before, that number was significantly higher." Tegra just achieved the one millionth part out of the first UR5 cell in less than a year. "The accuracy and repeatability over time was a big concern for us. We were questioning whether we could put the robot through this kind of duty cycle in a high volume cell and get year-after-year repeatability. But it is as good today as a year ago when we turned the cell on," says the Tegra Director of Engineering.